Image Title: Ascending the slope . Subiendo la cuesta. About Calle empinada en el barrio antiguo de Zamora. 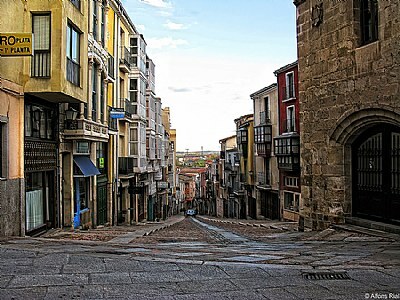 Steep street in the old town of Zamora. Love the colors and detail in this shot. Nice job! Very interesting street.Nicely captured after rain. Muchas gracias, Paul. Y no vi a ningún ciclista!! Wow, the steps would be fun inn a trail bike. Another lovely photo Alfons.